How Does Dr. Salivonchik Treat Gum Disease? In our last post we talked about the connection between gum disease and heart disease. Today we’d like to talk about one way Dr. Salivonchik is providing therapy for gum disease. 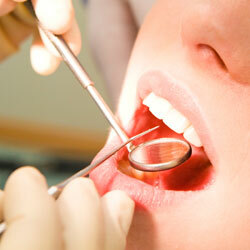 Traditionally, gum disease has been treated with basic tools. But today, dentists like Dr. Salivonchik are using dental lasers to provide more comfortable and effective treatment for gum disease. What makes it different from using traditional tools is that a laser seals at the same time as it treats damaged tissue. That reduces bleeding and results in a shorter recovery period. Why Is Treating Gum Disease Important? It’s been estimated that anywhere between 50-80% of the population has some form of gum disease, even if it’s only very mild. What’s more, gum disease is the leading cause of tooth loss in adults. But even that’s not all. As we mentioned in our last post, gum disease has been connected to health problems in other parts of the body as well. Have you recently been diagnosed with gum disease? Dr. Salivonchik has a fast, effective, and comfortable treatment option for you to consider. Call our Coplay dental office to find out more or to reserve an appointment. We’re located in Lehigh Valley and serve patients from Coplay, Allentown, Bethlehem, Easton, The Poconos, and beyond. Comments Off on How Does Dr. Salivonchik Treat Gum Disease?